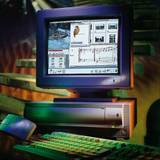 In 1994 Acorn released the Risc PC 600, a significant step forward from the Archimedes. The capabilities of all four of the building blocks of the Acorn ARM machines were improved (CPU, Memory Controller, Video Chip and IO Controller). The CPU was an ARM610, a new architecture version (ARMv3), and allowed improved performance per clock cycle, that meant the 30MHz ARM610 was noticeably faster than the 25MHz and 33MHz ARM3 parts that were fitted to the fastest of Acorn's previous machines. The memory controller (MMU) was moved on board the CPU in this new machine, as opposed to the separate MEMC chip in the Archimedes. The video chip was also of a new design, for the first time capable of displaying more than 256 colours (8-bit), with its ability to display 16million colours (24-bit). The sound system was also improved to support 8-channel 16-bit stereo sound, up from 8-channel 8-bit stereo sound, though this was not fitted as standard to early Risc PC machines. The Risc PC also was the first Acorn machine to support dedicated Video RAM, the optional small amount (1-2MB) of faster clocked RAM enabled higher resolution and colour depth at faster refresh rates. The IO chip now supported up to 8 podules and a network interface. Another significant feature of the Risc PC architecture was the ability to make use of non-ARM guest processor. Although initially targeting multiple CPU architectures only x86 processors were made available. From a 33MHz 486 to 133MHz IBM 586 parts. This allowed users to make use of Windows programs on the same hardware as RISC OS. At launch the RRP of the Risc PC 600 was £1249-1699 (ex. VAT) depending on configuration. The Risc PC 600 shipped with RISC OS 3.50 as standard. An iterative improvement to the Risc PC range came in 1995. The 40MHz ARM710 CPU gave a nice speed boost, and larger RAM, at least 1MB VRAM, larger discs and 16-bit sound as standard meant that, although costing the same price, the Risc PC now offered a bit more for your money. The Risc PC 700 shipped with RISC OS 3.60 as standard. The A7000 uses a similar concept to Acorn's ARM250 based machines. By combining the 3 main chips (CPU/MMU, Video Processor, IO Processor) of the Risc PC into one system-on-chip (the ARM7500) the cost of the building the machine could be reduced and a budget machine produced. The A7000 launched with a range of models with a RRP starting from £749 (ex VAT), well below that of the Risc PC. The A7000 shipped with RISC OS 3.60 as standard. Acorn's 1996 launch of a 200MHz StrongARM CPU card came as a much needed boost to the reputation of Acorn. 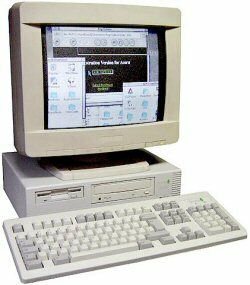 The 200MHz clock rate was ahead of comparable Pentium 1 systems available at the time. The performance was roughly five times that of the 40MHz ARM710, Acorn's previous fastest machine. For some BASIC tasks the gain was even greater, due to the BASIC interpreter fitting inside the StrongARM's larger on-processor cache. 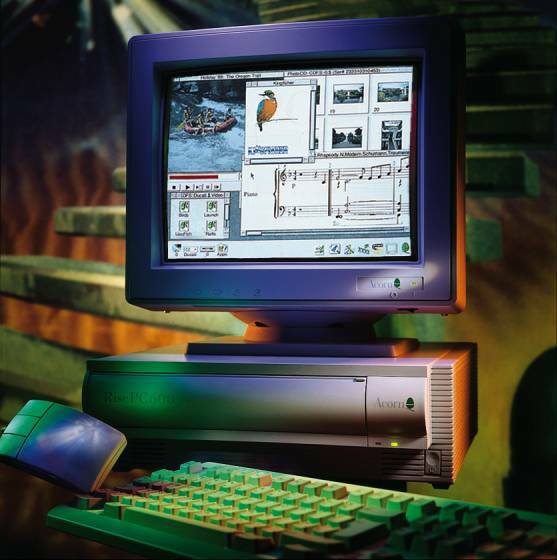 The StrongARM Risc PC shipped with RISC OS 3.70 as standard. With later 233MHz J233 models shipping with 3.71. An update to the A7000 budget model, the CPU was improved from a ARM7500 to ARM7500FE, which included a hardware floating-point module, very unusual for an Acorn machine. The clock speed was increased from 32MHz to 48MHz and the RAM was improved from FPM to EDO offering another increase in speed. The A7000+ shipped with RISC OS 3.71 as standard. RISC OS 3.50 provided support for the new Risc PC hardare (and dropped support for all previous hardware) including the new 16 and 24bit screen modes. The desktop was improved with the use outline fonts instead of the bitmap 'System Font' and tiled backgrounds in windows. RISC OS 3.70 provided support for the StrongARM processor. The StrongARM architecture (ARMv4) was different enough that lots of the preexisting software needed updating to run on it, including the OS. RISC OS 3.71 was a small update that ran on the new A7000+ as well as all the previous A7000 and Risc PC models.